Shopping apps can now offer you the same selection, access, and convenience as what you’d find with your desktop browser. The latest wave of shopping apps is better tailored to how people process and search for information on their smartphones. Choosing the most helpful app for your smartphone can help you shop online at the cheapest prices and easily find what you need. So, we found for you one great shopping app to save you money. Let’s see what the app is all about. What is Poiskus all about? 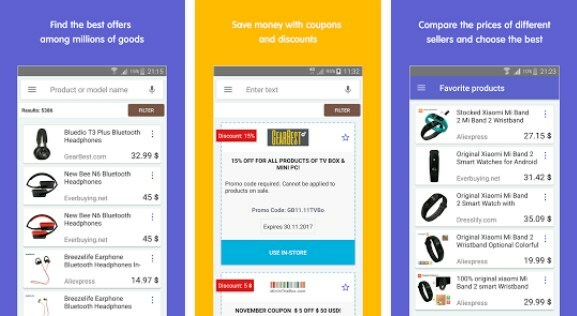 Poiskus is an online shopping app which is developed for IOS and android users to help them save considerable amount of money by shopping in Chinese online stores with discounts, comparing of prices and special offers. With the help of this app and incredibly convenient interface with third-party ads, users will be able find and shop for goods at the cheapest prices at the world. Users can shop online in different stores such as Aliexpress, GearBest, DX.com, DHgate, Banggood, Pandahall and find the best prices among million offers. The app offers saving money and enjoying shopping in the same time. With this very practical and useful app for shopping online in Chinese stores is offering users a simple and quick way for purchasing online the goods they need while saving them many by offering them to use special offers and discounts. On the app, users are offered to search for products in various categories such as phones, computer accessories, costumes, clothing, shoes, watches, jewellery, toys and other baby products, cosmetic, sport’s products and many others. Looking and finding goods by users is easily done because the apps is finding and giving the users the best special and promotional offers and discounts they need to save a great amount of money and also offering them free delivery of their goods. Purchasing goods at the lowest prices as possible is offered by the app because additional discounts are given to users when they need them. Users are being notified anytime when there is seasonal sale and special offer in stores. Entire categories with cut-prices articles can be found on the app. Download it for free on Google Play and App Store to find special offers and discounts for online stores!